It has often been asked if applications should be practiced outside karate kata exactly as they are performed in the kata, or whether they should be modified to meet variations in the situation. Kata are sequential performances of prearranged techniques passed on from teacher to students. For centuries they have been a central teaching method of karate and they reveal not only function and application, but spirit and some say "secrets" as well. Thus, the question is an important one, since it affects the very heritage and understanding of karate itself. Chotoku Omine-sensei (who was the head of Matsubayashi Ryu in the Americas) once told me that he regarded kata as the skeletal structure of karate. According to this generous and great Okinawan teacher (dead some twenty years now, unfortunately), kata practiced with strict dedication makes strong karate bones (mental, more than physical), but bones alone can't do much. The art comes with how you refine and define the musculature that surrounds the skeleton and how you strengthen and refine the mind that moves the muscles that move the bones that you've made strong. We can regard kata as the optimal expression of a movement or technique, but we can also regard kata as the foundation from which the real expression of karate technique builds upward and outward and inward. Both points of view are constructive, but some moves in some of the kata are executed purposely from less than optimal circumstances. Another teacher who has made a significant contribution to my development, Takayoshi Nagamine-sensei (who has succeeded his father, Shoshin Nagamine, as the head of Matsubayashi Ryu), told me that every kata is a riddle and that every visible move hides the truly important invisible or "hidden" move or application (called bunkai in Japanese). The kata that we see is the "me kata" ("me" is a Japanese word for "eye") that occupies the eye while the real stuff goes on just below the level that we can register with our conscious mind. This teacher's own teacher, Seigi Nakamura, with whom I studied for a short while, too, had rebuked him by saying that referring to a move as a "hidden" move makes it seem as though the moves are secret and are only given to the favored few, when actually they are there for everyone to see, if they're willing to use their eyes in an unfettered manner. Nakamura-sensei preferred to call the "hidden" moves "intermediary" moves, because they occur between the obvious-to-the-eye basic moves, and because they are not exotic or special, but are just a little harder to catch. The key to catching them, by the way, is to watch the koshi (pelvic carriage) and hikite (pulling hand) carefully to penetrate the sleight of hand. Yet another teacher, Katsuhiko Shinzato*, who has graciously served as a personal mentor, uses the well-known analogy of comparing kata to calligraphy, the art of writing kanji characters. The first definable level on the continuum of kata performance is kaisho, or character printing in a somewhat stiff block style. Beginners do their kata this way, but so do advanced students when they're teaching beginners or adhering to a standard of the ryu during group performances. Movements are angular, thick, and well defined. "Hidden" moves are hidden away for some other time or, in the case of beginners or the lazy, not yet discovered. The next discrete level of performance is gyosho, or semicursive writing that is not as stiff and more flowing. This is cursive writing like it's done by school kids. The individual letters (movements) are joined together with big loops and roundish patterns. The words are still very easy to read, but there is now room for the intermediary techniques, too. Individuality comes into play. Good black belts and exceptional brown belts perform their kata in this manner. The highest discrete or definable level of performance is sosho (grass writing), or cursive writing which is free flowing and that allows freedom of physical and aesthetic expression. This is cursive writing as done by strong, mature individuals. You can make out the words still, but the words are accompanied by the poetry of the movement of the letters. The words should flow like ripples in the prairie grass on a windy day. The grass talks at these times, and so kata tells a story independent of and in addition to its components when done this way. Corners are cut, strokes may be dropped, but the flow is powerful. This is the level of performance of one who is truly a master of the kata. You might not perform all kata at this level, but usually mastery of any kata to this level means mastery of all kata to this level. Of course, there's always scribbling, and I've seen and done a lot of scribbled kata in my time. Ultimately, we should be able to give birth to our techniques like a tree sways when the wind blows. Or when you scratch an itch -- no thought. 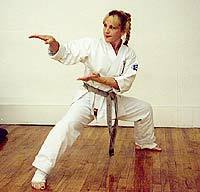 Note: This article was edited by Wendy Hiester Gilbert (FightingArts Copy Editor), developed from material supplied by George Donahue that originally appeared as his answer to questions on the subject of kata that appeared on the Karate Cyber Dojo in May of 1997.